Yoga gave her a new perspective about life. Yoga has given her a new meaning and purpose to life. With a masters in apparel designing, a bright woman, got married and has been a devout home maker, a simple yet strong mother. Her family was her only view of the world, which she has very ably groomed into a haven. Fifteen years after marriage, she casually came across Vedavalli as a neighbor practicing and teaching yoga. Attended the courses of Satyananda Yoga Centre from Veda to begin with and completed the Sadhana Shibiram. Presently participating in the Pratyahara Dharana Shibiram. She has also undergone our training to teach yoga to exceptional children, and has worked at MADHURAM NARAYAN CENTRE FOR EXCEPTIONAL CHILDREN as a seva! She has turned a new leaf in her life with the help of yoga and bloomed into a budding and promising teacher of the centre. Her gentle straight forward approach has a profound influence on people who come in contact with her. 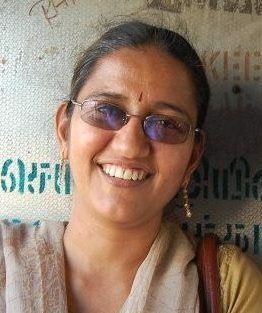 She conducts courses in Schools and at the centre. Yoga has freed her from her limitations and she is soaring high in her teaching life. I never thought I will be teaching yoga in my life. my relatives and friends from college still raise an eyebrow,”how come yoga?” After 15 years of married life, I suddenly felt a vacuum in my life. What have I done and what am I going to do in future? I was like a rudderless ship with no goal and purpose in life. By Guru’s grace Vedavalli moved in as my neighbor and introduced me to yoga and Jaigopal Sir. And I could see a great transformation in me. I came out of my cocoon and started learning yoga. The service at Madhuram Narayanan centre gave me a new perspective to life. And then came Teaching school children which has made me realize myself. Learning Yoga, teaching Yoga and the satsang, association with SYC is what I cherish the most now.